I was doing some kinetic experiments when I came across the V​itamin C Clock Reaction published in the Journal of Chemical Education1. That reaction is very impressive because of the sudden color change and the simple yet interesting chemistry. I found this chemical kinetics demo very useful. My students are able to see when one reaction ends and the other one steps in. It is easily doable with household items (vitamin C, hydrogen peroxide, starch and tincture of iodine). I eventually became interested in finding the Vitamin C concentration as well, going over the methods that can be used to determine the concentration of that compound in several products (juices, candies etc). Many household substances can be used, but the product I chose for this activity is Ball® Fruit Fresh. It is not available in Italy, but a friend from the U.S. brought me some. I would have liked to use some spectrometric methods but I thought they would be too expensive in terms of reagents and subsequent disposal of them. Figure 1 - Equipment and Chemicals required for the activity. 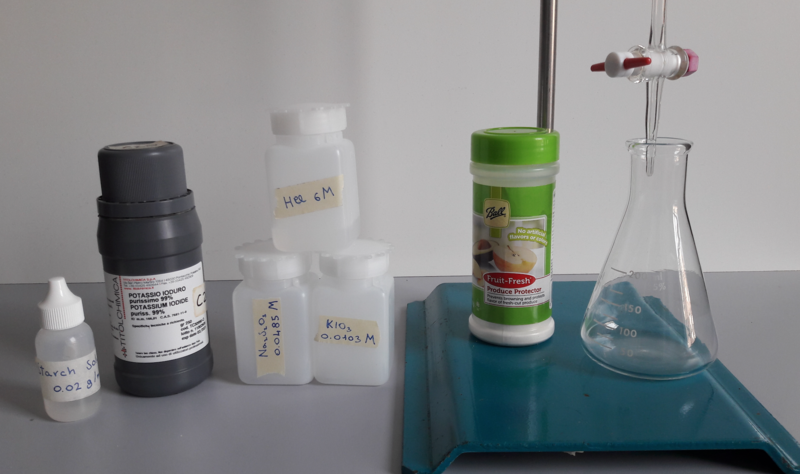 Neither the standardization of sodium thiosulfate nor the actual titration of iodine involve the use of dangerous chemicals (except for quite concentrated hydrochloric acid); in addition, the method is relatively easy, quick and accurate. Iodine is readily reduced by Vitamin C. Knowing the initial amount of iodine in the solution that is reduced by sodium thiosulfate, it is possible to determine the content of Vitamin C in a specific product. 1 - The first reaction takes place between iodate (IO3​-) with excess of iodide (I-​ ​) in acid environment. Iodine (I​2)​ is produced. The solution turns dark-brown. Of course, in order to carry out the titration, sodium thiosulfate needs to be standardized (see the teacher document in the supporting informaiton). 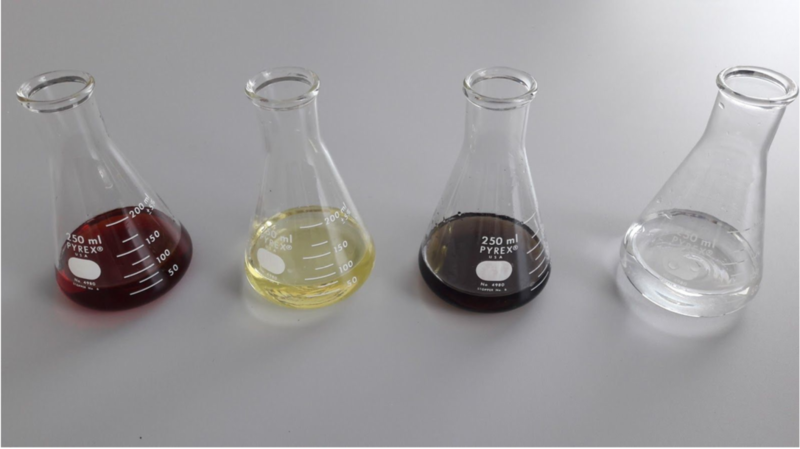 Start adding the Na​2S​2O​3 solution, drop by drop; the mixture in the flask will eventually become clearer, going from dark-brown to a yellowish kind of color. When the solution is light yellow, add a couple of drops of starch solution; you will get a dark-purple color. Continue adding sodium thiosulphate until the solution is colorless. That means that titration process is complete. Color changes happening during the process are shown in figure 2. This activity was developed as an IA (Internal Assessment) for the IB (International baccalureate) curriculum. Even though I haven't used the activity with an entire classroom of students yet, I worked closely with a student who wanted to test different items containing vitamin C. I did some research to design the chemical method and then we developed the actual procedure. This student and I completed many trials with different substances (including Ball® Fruit Fresh) and the method worked very well for us. I also repeated the entire experiment on my own with a defined amount of Vitamin C in order to confirm our results. I hope you can try this procedure in your lab. You can experiment with other substances such as orange juice, vitamin supplements and other household items. I think you will find it useful; calculations are not the usual ones used for a classic acid-base titrations. It may also help you to introduce new concepts in your lessons. If you use it, please let me know how it goes. I am open to suggestions for improvements. 1 - Wright, Stephen W., Vitamin C Clock Reaction, J. Chem. Ed., 2002, 79 (1), p 41.